Come one, come all! Renowned for its glamorous parties, the Metropolitan Museum of Art will be hosting the CAA Centennial Reception during the 2011 Annual Conference in New York. Join your friends and colleagues, fellow conference attendees, and special guests for an unforgettable evening that will celebrate the beginning of CAA’s Centennial year. 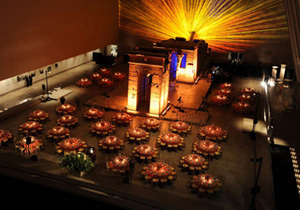 The reception will take place on Thursday evening, February 10, 7:30–9:00 PM, in the magnificent spaces of the Great Hall and the Temple of Dendur, and the passage of Egyptian art between them. It immediately follows the presentation of CAA’s 2011 Awards for Distinction in the Grace Rainey Rogers Auditorium. Wine, beer, soft drinks, and hors d’oeuvre will be served. The Met Store will be open too, making available its excellent inventory of gift items in addition to its superb collection of art monographs, catalogues, and books. CAA is grateful to Thomas Campbell, director of the Metropolitan, for generously opening the museum for this special occasion. A $35 ticket is required for admission. Although online sales have ended, you may pick up a ticket at the Events Tickets booth in the Registration Area at the Hilton New York, 2nd Floor Promenade. CAA will not be selling tickets at the museum. The awards presentation, however, is free and open to the public. The Metropolitan Museum of Art is located at 1000 Fifth Avenue at 82nd Street on Manhattan’s Upper East Side. To attend the reception, climb the stairs and walk through the main museum entrance. To attend the awards ceremony, taking place 6:00–7:30 PM, enter the auditorium through the 83rd Street entrance. Conference attendees may also visit the museum free of charge during the week just by showing their registrant badges.